Results are available are available here. DogOnto is an ontology describing aspects of intelligent domotic environments. The following table summarizes the information about ontologies' sizes. Participants can test their tools using the standard benchmark dataset described above, which can be downloaded here. They can enforce testing with a subset of data sets built with reference ontologies used in previous campaigns, which are stored in the Test Data Repository accessible through the SEALS portal. 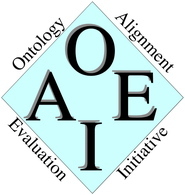 Note that two of these data sets were built based on the same reference ontologies (biblio and finance) which will be used in OAEI 2014.